Lost creator JJ Abrams’ Super 8 may be heavily inspired by the early films of Steven Spielberg but if you’re going to borrow from someone, why not make it a master? It’s a science fiction adventure that harks back to the character-driven values of the late 1970s and early 1980s; Abrams’ film provides a potent reminder of why Spielberg’s classics (Jaws, ET, Close Encounters ... ) continue to stand the test of time. 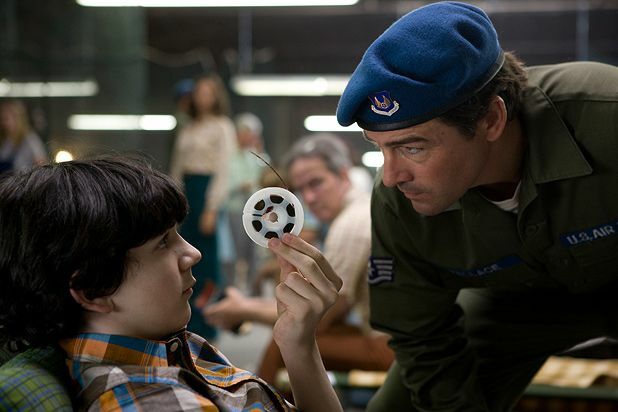 Super 8 combines a scary but rarely seen monster with a heightened sense of tension and a strong sense of character as evidenced by the strong emotional connection between its central players (akin to the Spielberg-penned The Goonies). It exhilarates and makes you care. Set in an Ohio steel town during the summer of ’79, the film follows 14-year-old Joe Lamb (newcomer Joel Courtney) as he struggles to cope with the death of his mother and an emotionally detached dad (Kyle Chandler) while making a Super 8 zombie flick with his friends. At the same time, a rail accident may have released a mysterious creature into their midst. Abrams’ film may have been marketed around the monster but it is primarily a coming-of-age story that places its young heroes front and centre. This proves a master-stroke, however, as they provide a tremendously endearing presence, whether through Elle Fanning’s innocent love interest or Riley Griffiths' feisty young director. Their camaraderie is so strong, in fact, that their ensuing scrapes are all the more funny, exciting and moving. So, even if the big reveal involving the creature disappoints with its brevity, it doesn’t detract from the overall enjoyment of the piece, which is even capped off by a hilarious edit of the kids’ zombie film during the end credits. Super 8 is a loving homage to the way blockbusters used to be, which carries its own lessons for Abrams’ contemporaries today. General release from Fri 5 Aug.